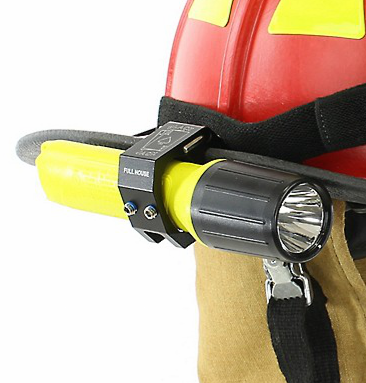 Blackjack has improved on their flashlight holders with a NEW stronger, yet lighter design so it can withstand the toughness of the job, but not weigh you down. The new ACE and FULL HOUSE models won't disappoint, and you can't go wrong, because they both now come with a LIFETIME WARRANTY. One purchase and you'll never need a new holder, ever again! Our Blackjack mounts securely to the most popular handheld fire and tactical flashlights out there today, directly to your helmet. The unique Blackjack design holds the light under or over the brim of your helmet, giving you the choice and the convenience of location. Because of it's rugged design it protects the lights against impact, snags and dirt. The location of the mount allows for the light to be aligned closer to your line of sight making your visibility that much better. So, what's "new and improved" you ask? The new models have added the allen key to the body that tucks away so that you have it right there when you need it. Blackjack widened the new model slightly to make a better, more stable platform on the helmet, and replaced all the hardware with a stainless steel thread locker applied to keep them from backing out. They also added nylon tips to the set screws that hold the light to reduce the damage, and provide for a better hold. The new model also has a cut-out to reduce the weight and make it lighter on your helmet. Fits: Surefire 6P, G2, G2L, G2D, G3L, G3D. Streamlight Polytac. Pelican M6 2390B, and M6 2320C. Fits: Pelican 4AA Stealth light series, UK 3/4AA lights, Streamlight 4AA Pro Polymer and 3AA Haz LO models. So what are you waiting for? 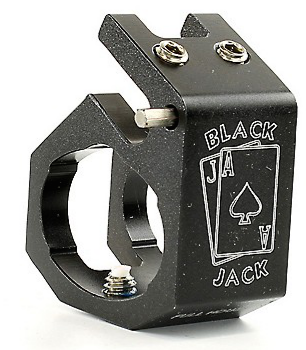 Get a new BlackJack holder for a fraction of the price of other mounts, at $25 with a lifetime warranty, it's plain as day--a smart choice. Once I wasted almost all my month money in the online casino and thought that all of them I made to be unfair. Until I read this blackjack tips. Then I realised my mistakes and had a chance to return all my money. You can play blackjack game at online casino as well.